Some time back, I was being recorded for a “talk-show” for ZDnet WebTV – the topic was smart cities, IoT etc. In the same talk show was Olivier Sellès, from Bouygues Immobilier, who is deeply involved in IssyGrid. I did not know Olivier in advance, but given that I have been involved in the French national SO-GRID project, we quickly hit it off and a lot of the conversation became about our experiences, views, and thoughts on the Smart Grid. Stéphane Paccaud from HP Enterprises brought a more general IoT perspective to the discussion – which, by the way, was expertly animated by Philippe Roux. I didn’t actually know Olivier and Stephane before we met on set, but we had an interesting discussion – both on and off screen. 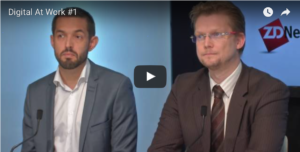 The show is part of a new “Digital@Work” series from ZDnet, and is available (in French, alas) here: Vidéo Digital@Work : Usage et sécurité des smart cities, où en est-on ?